Fearful investors who bought up Ibovespa puts on Friday to protect themselves in the event of a weaker-than-expected showing from right-wing pro-market candidate Jair Bolsonaro can breath a sigh of relief. In a showing that suggests he will almost certainly lock up the presidency in the second-round vote on Oct. 28, Bolsonaro won more than 46% in Sunday's first-round vote, pummeling his closest rival, Workers' Party candidate and Lula proxy Fernando Haddad, who walked away with barely 30%. Just as they did during Bolsonaro's advance in the polls, Brazilian assets cheered his stronger than expected first place finish as stocks and the real soared. Analysts at BAML and JP Morgan scrambled to upgrade their price targets on state-run energy company Petrobras (BAML upgraded Petrobras to a 'Buy' with a target of $20 a share and JPM upgraded it to 'overweight' at $17 a share). Other analysts opined that, assuming Bolsonaro can win over the support from at least a few center-right candidates, he should have no trouble winning the presidency and seizing control of an economy that's mired in its worst-ever economic collapse. As one analyst told Bloomberg, markets now see Bolsonaro's victory in the second round as "a done deal" - that is, barring some unforeseen gaffe or slip. 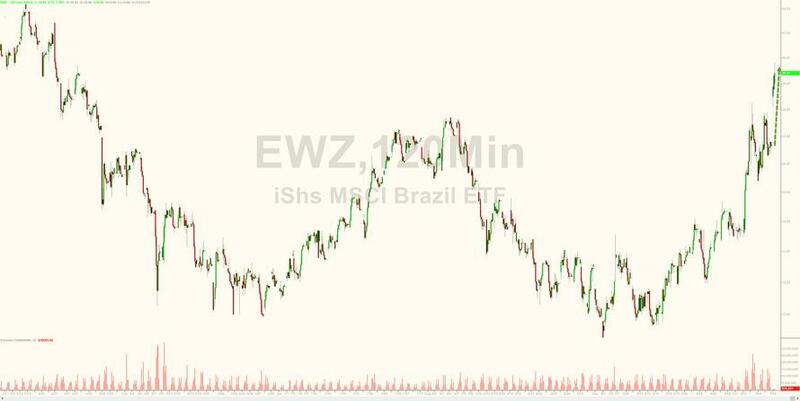 "It’s a done deal that he’s going to be the next president of Brazil unless something very unforeseen happens," said Bernd Berg, a strategist at Woodman Asset Management AG in Zug, Switzerland who sees the main stock gauge rising above 100,000 and the real stronger than 3.6 per U.S. dollar in the next few weeks. "The larger than expected gain of conservative mandates in Congress is highly positive for Brazilian assets in the short-run as it will improve the outlook for much needed reforms in a potential center-right government." But given these heightened expectations, Brazilian assets, which rallied as Bolsonaro rose in the polls, could be vulnerable to a "sell the fact" slide once Bolsonaro wins and investors' turn their attention to the herculean nature of the task ahead. "Bolsonaro’s momentum is really strong and it seems that he will have it relatively easy to win the second round," said Tania Escobedo, a strategist at RBC Capital Markets in New York and the most accurate forecaster for the Brazilian real in the first and second quarters of 2018 this year, according to Bloomberg rankings. "That being said, the market was pretty optimistic on his prospects already and market participants positioned for this scenario." Still, one thing's for sure: Bolsonaro's victory had not been fully priced in, as Alejo Czerwonko, a strategist at UBS Wealth Management in New York, told Bloomberg. "Bolsonaro’s showing was stronger than expected, and although the market has been moving in recent days to price in momentum in his favor, today’s results should provide additional support to Brazilian assets." "I don’t think the strength of his showing today was fully priced in." Alberto Ramos said analysts will now turn their attention to the composition of the federal legislature as they bet that the election of conservatives could "help strengthen governability and the capacity to move forward with key reforms." Gustavo Rangel, chief Latin America economist at ING in New York, said conservatives victories over a handful of left-wing candidates in the southeast could solidify Bolsonaro's presidential mandate (again, assuming he wins in the second round). "Loss of important traditional names of the Workers’ Party for the Senate in the Southeast is also a particular blow for the left, and presages a larger-than-expected center-right base in Congress. This bodes well for the eventual construction of a right-leaning base in Congress, should Bolsonaro get elected, increasing the chances of passage of the fiscal-austerity measures the candidate has proposed." Still, his victory is looking likely enough that markets will probably price it in before he wins, which lead to a slight reversal in a "sell the fact" selloff once Bolsonaro actually wins. "Looking pretty good for Bolsonaro in the second round and assuming no major slip-ups from him over the next few weeks, the markets will price his victory in the second round even before he actually wins." James Gulbrandsen, a Rio de Janeiro-based money manager who helps oversee $3.5 billion at NCH Capital, told Bloomberg that "the odds of a Congress that will pass reforms has skyrocketed" thanks to a hostile anti-PT wave that swept the Congress. "Perhaps more surprising than Bolsonaro’s performance is the anti-PT (Workers’ Party) wave that could really create a very different senate and congress. One that would facilitate passage of much-needed reforms. That’s enormously positive." "The odds of a Congress that will pass reforms just skyrocketed. This is the principal concern of the market. 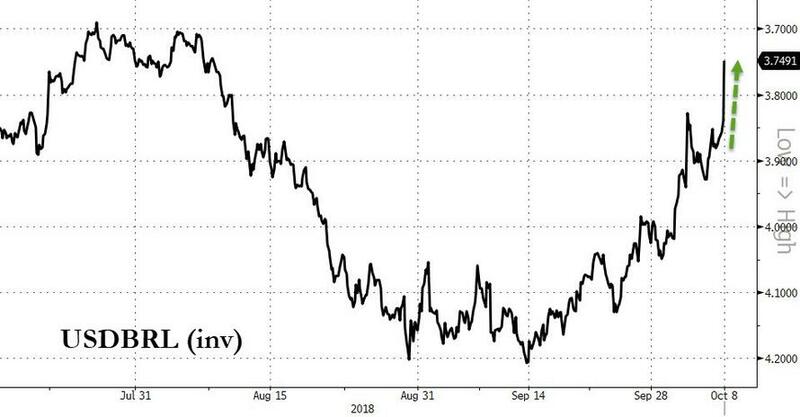 I expect a large rally in Brazilian assets on Monday." While markets will likely celebrate Bolsonaro's victory over the coming days, at some point, investors will need to see Bolsonaro make good on his promises if he wants to keep the recovery in Brazilian assets going. But questions about his ability to execute could lead to "significant concerns" down the road. "That said, and beyond initial reactions and some potential honeymoon, there are significant concerns on a Bolsonaro presidency down the road, including the stability of his platform, overall polarization or his capacity to build consensus supporting the needed reforms." But looking beyond the immediate future to notable tail risk, it's worth considering that Bolsonaro was nearly assassinated at a campaign rally last month. With the country's once-ascendant left frothing at the prospect of a right-wing former military officer taking power, a wave of political violence wouldn't be out of the question.